Winter here on the Prairies is no joke– the cold, wind, snow and ice could freeze any vehicle in its tracks. If you park outdoors during the winter, it is important to know the proper way to treat your vehicle so it operates smoothly throughout the colder months. Keep reading for Park Muffler’s guide to starting your vehicle in the cold. The first step is understanding why your vehicle might have trouble starting. First of all, the chemicals in batteries can become much less reactive in cold conditions, limiting its electrical output– but your vehicle needs a reliable flow of electricity to start! Oil and gasoline also move slower in the cold, which puts even more pressure on the electrical system to get your engine moving. Other systems such as fuel lines can also experience serious issues if it gets cold enough. The following preventive measures may seem obvious, but they may make a major difference when the temperature drops. The only foolproof way is to park in a heated garage, but short of that luxury an unheated garage, carport, overhang or even a big tree can help shelter your vehicle. 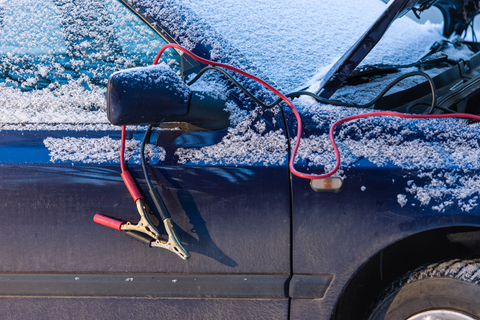 Another successful strategy is to find a plugin and make use of a battery or block heater designed to keep your engine safe from the elements. Seasonal tune-ups at Park Muffler is another effective way to stay on top of your vehicle’s condition, no matter the weather. Always keep jumper cables in your vehicle– tow trucks, friends and Good Samaritans might forget! As any Albertan knows, our winters can be as vicious as they can be magical. Don’t let weather get in the way of your everyday life– have your vehicle winterized at Park Muffler before the snow falls!